It blends cool design, a warm atmosphere and affordable prices. It's owner is a tourist guide - an expert on knowing Skopje and Macedonia, so helping you explore the country will be his pleasure! A great hostel for sure. Very nice hostel, with a witty manager. You can email the hostel so they can pick you up from the Struga's Bus Terminal, which is cool. The hostel has a nice commom area, hot shower and one of the most delicious breakfast I ever had. And you can do all the touristics atraction by foot. Very clean hostel with big bathroom. The breakfast was good and the staff helpfull. Also easy to find because they putted signs at the streets pointing the direction to the hostel, which was really smart. 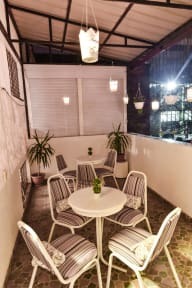 Cozy hostel, very well organized which allow other travelers to meet each other. Common room next to the reception very well equipped, as the same to the kitchen. The rooms are spacious, beds with curtains which promote to each one a little more privacy within an environment not private as itself, quite great.